It only takes 6 ingredients and 15 minutes to create copycat Pesto Cavatappi at home. It’s faster, cheaper, and tastier than the Noodles & Company version! Pasta can be one of the cheapest meals around, but once in a while it’s worth it to overpay because you just love a dish so much. The Pesto Cavatappi at Noodles & Company is that sort of dish: Chewy noodles and a creamy pesto sauce with a few bright pieces of tomato and mushroom to keep things interested. Nevermind that I can buy a half-dozen boxes of pasta at the grocery store for the price of one bowl at Noodles… it’s really very delicious, and it’s one of many great options. The only problem in this scenario? Noodles & Company isn’t in Los Angeles! Luckily, I can whip up my own better version of the dish in a flash. Part 1: Pesto. 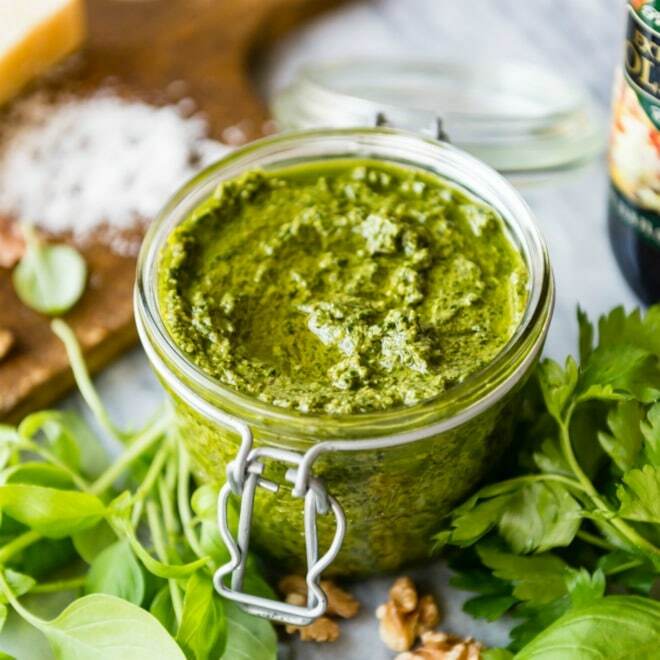 You can either buy pesto, or use my Basil-Walnut Pesto recipe which is what I did. I tend to keep a jar in the freezer for times like this, although you can find it at most grocery stores now too. With a few other ingredients, you’ll whip up a delicious pesto-cream sauce in no time. Part 2: Cavatappi. This is a noodle, obviously. 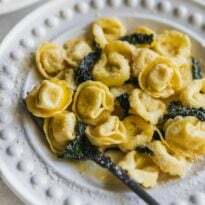 You could really use any type of pasta you want, but you want something with nooks and crannies to trap the flavorful sauce and infuse the dish with flavor. That’s what you’re looking for. A handful of bright, flavorful tomatoes and a few mushroom slices complete the dish. Feel free to add chicken if you need a protein! Looking for a gluten-free option? Sub brown rice pasta as seen in my Kale Pesto Pasta recipe. Watch this video to see how easy Pesto is to make – and 4 other things you can do with it! It only takes 6 ingredients and 15 minutes to create copycat Pesto Cavatappi at home. It's faster, cheaper, and tastier than the Noodles & Company version! In a large saucepan or stock pot, bring 4 quarts of water and salt to a boil. Add pasta and cook until al dente, about 10 to 12 minutes. Drain well. Meanwhile, heat oil in a large skillet over medium-high heat until shimmering. Add tomatoes and mushrooms (if using) and cook for about 5 minutes, until some of the liquid has been released and the tomatoes are heated through. Stir in the broth, wine, and cream and bring to a boil; reduce heat to medium and cook until the sauce has thickened slightly, about 2 minutes. Add pesto and stir until heated through, about 2 minutes. Add pasta and toss until uniformly coated in the sauce. Transfer to a serving dish or individual plates and garnish with Parmesan cheese. More chicken broth can be used in place of the white wine. Ha, yep. I love this dish + their tuscan linguine. Ooh yum, pinning this for later. Thanks. Do you make your own pesto? If so, would you share the recipe? Is there a good store bought pesto? Hey there! I DO make my own pesto, it’s one of my favorite things to make. My version is made with walnuts thought, not pine nuts, because pine nuts are so expensive. But I think it tastes great. 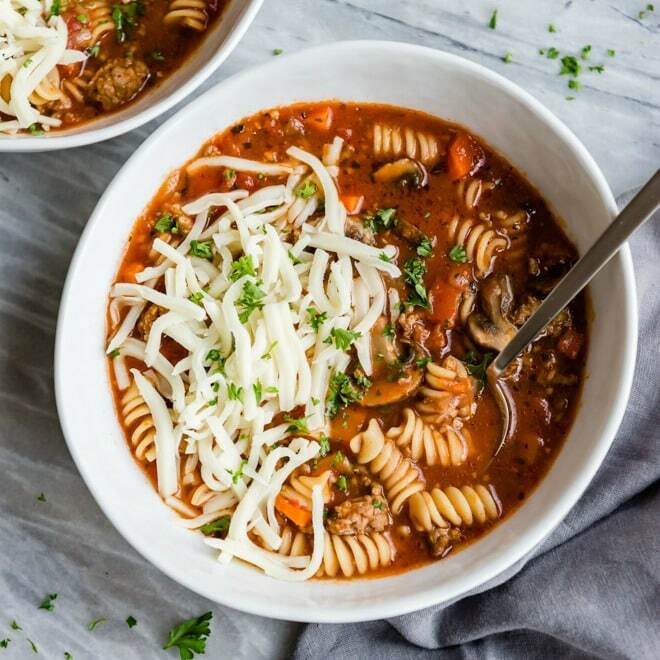 The recipe below is technically a vegan version, but I have a note about adding Parmesan cheese at the bottom of the recipe if cheese is your thing. Cheese is definitely my thing! Thanks and please let me know if you have any questions! Only missing one thing, mushrooms! I’ve been a fan of Noodles and Co since moving to Wisconsin from NY. Will be trying this recipe this week! Dawn, you are really right about the mushrooms. I left them out because no one in my family will eat them but me… but YES! I will have to go review this post and make sure I at least MENTION the mushrooms. Because yes. You are so right! Hi Josh, I don’t! Next time I’m in Wisconsin I’ll order that so I can try it and replicate it. :) Thanks for the suggestion! As an employee of Noodles & Company I’ll give you a few tips, we use half broth and half white wine, also go easy on the oil as we only use a spray or two. Thank you so much, Zoey! Much appreciated. :) I’ll update the recipe with your suggestions. I always wanted to get a job there just to learn how to make all the amazingness. I just made this last night, It was AMAZING!!! Seriously the best copycat recipe I’ve ever made, good work. I would love to make it again. Just wish I had cavatappi noodles, any recommendations on where to find those? Also, where do you buy your basil in such large quantities for your homemade pesto? Or do you grow it yourself? Hi Lauren! So glad you loved this recipe. I’m obsessed with it, especially since there are no Noodles & Co. where I live. I find Cavatappi noodles at my Ralph’s store (a Kroger store and it’s their label, “Private selection”). I agree, sometimes they are hard to find. I checked on Amazon; they have them but they’re pretty pricey. DeCecco is the pasta brand I’m seeing on Amazon, so if you know if your stores carry that brand, you might be able to find it. I checked Walmart.com and they have some deals but you have to buy massive amounts. However, they indicate that Ronzoni brand cavatappi is sold in stores (not at any within 50 miles of me, though). Good luck! I hope you track down that fantastic noodles. Oh, and the pesto. I buy the basil plants at Trader Joe’s, generally, and then in the summer yes I grow it myself in an Earthbox (I don’t have a yard; I start with the TJ’s plant and transfer it to the Earthbox). I tend to make this more in the summer for sure because the plants do so well. Good luck and thanks for your questions. I love feeling useful! Take care. Not sure where you are, but my local Meijer has store brand cavatappi noodles. barilla has cellentani noodles, if you store doesn’t carry, they may be able to request. They may be slightly smaller, but they work! Can you leave out the wine? YES! I actually never had it in the recipe until recently when a former Noodles & Co. employee informed me that’s what they use. Just use chicken broth in place of the wine. I’ll update the recipe. Thank you for your question! Would White Cooking Wine work? I hear the taste is nothing like drinking wine. Thoughts? I definitely think it would work, Whitney. White cooking wine tends to be a little sweeter/richer in my opinion, but I think a lot of that would cook off in the pan. And pesto is super flavorful – a little white cooking wine could never compete! I promise this is my last question… would you prefer to substitute the white wine with chicken broth or white cooking wine? Ask all the questions you want. :) For me personally, I would rather substitute with more chicken broth. The reason is, the white wine is a very recent addition to the recipe (as of January 2017) because a former Noodles & Co. employee told me they use white wine at the restaurant. Up until that point (and you can see the comment above) I used only chicken broth and I thought it tasted perfect. However, if I get insider info like that, I will always change the recipe to reflect it. So. If you had visited this blog in December of 2016, you would have seen the recipe written with 1/2 cup chicken broth, no white wine in sight. So that’s how I’d make it. I hope that helps! I used to live in Madison, WI and Noodles and Co on State St was one of our favourite places to go! I ALWAYS orxerex the pesto cavatappi, always! And now I live in the U.P. of MI and there is no Noodles within 3 1/2hours, so i was really excited to see your recipe today when brainstorming dinner ideas! We all love pesto in our family but I never know what to do with it, and have tried some horrid recipes! But yours was so easy, quick and tasted EXACTLY like my favorite dish from Noidles I had been craving!! Thank you so much and you have a new follower for life, especially if all your stuff is that easy and delicious!! Hi Missi! Are you a fellow badger?? I first learned about Noodles & Co. in Madison, too, although now they are more wide spread (but not in the UP, ha ha!). Thank you so much for the lovely comment, and I hope you like anything else you may come across on the site. :) Thanks again and take care! I lived down there for 2 years, I’m originally from the UP and had to move back when my mom got really sick! But I still root for the Badgers and go visit friends as often as I can.. Now my daughter, who was born there, is working hard in high school to go to UW, so she can go back home!! I was never homesick for tbe UP but oh my God was I homesick for Madison when I left, I cried for months! 15 years later and I would still move back in a heartbeat if I could!! Love the recipes and the tips!! Talk to ya soon my fellow Badger friend!! For a healthier version, is there an option to replace the heavy cream with something? Or can I just take it out? I made this tonight and the family LOVED it. It was DELICIOUS! I followed the recipe but used vegetable broth and white cooking wine as those were the items I had on hand. Absolutely DELISH! Thank you, Meggan! I made this tonight for dinner and the family LOVED it. I followed the recipe but used vegetable broth and white cooking wine as that is what I had on hand. Absolutely DELISH! Thank you, Meggan! Can I use half and half instead of heavy cream? Hi Christina, yes I think so! I can’t think of any reason why not. If the sauce consistency seems loose, just simmer it a little longer. You should be fine! Thank you! So i see how many servings this is for, but do you know how much is in each serving size , like how much is one serving size? Hi Ariana, I just picked up the ingredients so I can make this and measure it out. I’ll report back by the end of the day. Thanks for the question! Hi Ariana! 8 (1-cup) servings. This will vary slightly depending on the size of your tomato, but you’ll get at least 8 servings out of it (8 generous 1-cup servings, I’d say). Thanks for the question! I am so excited to try this! I am from Michigan and live in California now and there is not one noodles and company near me! I used to get pesti cavatappi with shrimp! So I am excited to add that to this recipe! Did you ever use store bought pesto sauce? If so did you like it that way to? This recipe is amazing!!! It tastes exactly like the real deal, I don’t think I’ll ever go to Noodles again. 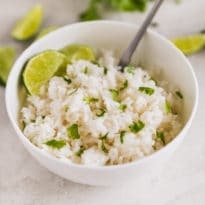 Great, great recipe, and so easy to make! Made this last week, making it again today because my family loved it so much. Thanks!